The author will remember the third inter-Korean summit as a combination of an unprecedented PR impact and relatively modest results, skillfully fetched out with profound symbolism in every element of the protocol. There were many smiles and beautiful, partially staged photos. In the end, even the South Korean media let slip that president Moon spent two days before the summit for rehearsals. Kim Jong-un was cheerful, having a part of the South Korean audience shocked by a blatant inconsistency with the established clichés. The Southerners held the summit “on their own half of the demilitarized zone” for the first time. However, the experts should consider not the given embraces, but the results caused by these embraces. The main significance of the summit is the very fact that it took place. The event itself and the statements made on it had the support of the international community, so the Olympic warming could continue for 2 - 3 months at least. However, it is still unclear if the tactical warming will turn into a strategic course. - The text is future-directed, in the sense that the parties pledge “to take measures for”, “strive for” and “actively participate in”. The specifics are less than expected. - Considering the regime of reducing military tension, there is a certain pullback to the level existed between the North and the South in 2013-2015. This is good. However, the refusal from hostile actions will be tested for the first time according to the reaction of the South Korean authorities to yet another attempt of conservative NGOs to launch a new portion of leaflets to the North. - From new ideas, we have only the military communications center in Kaesong. Because the negotiations at a high level, activation of military contacts, and the development of confidence-building measures - all this we have already seen. Even the extremely important idea of the peaceful zone on the disputed maritime boundary (the so-called northern demarcation line) in the Yellow Sea has already been recorded following the 2007 summit. - The same goes for the railways reunification, since in fact it is a question of restoring a regular communication from the South to the North Korean Kaesong – which was stopped in 2016, when the RK authorities closed the joint industrial complex there. - In order to avoid a breakdown, the agenda was cleared of any hot topics. Neither human rights in the DPRK nor economic cooperation were discussed. 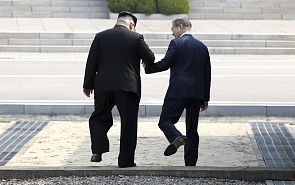 Moreover, even the denuclearization topic did not find any special attention in the final declaration: Kim deliberately announced the moratorium earlier (so that it was impossible to say that he was pressured or persuaded), so the leaders of the South and North simply confirmed the unified goal of declaring the Korean peninsula a nuclear-free zone. - They did not sign a special document summarizing the Korean War. This was decided to be signed later (presumably, until the end of 2018), on an extra tripartite summit involving the US or the four-way with the participation of the US and China. - The cultural exchanges and the resumption of meetings of separated families are some good things, but its meaning is either ceremonial or affects a small group of relatives. We must take into account that the opportunities for the breakthrough were very much limited. The political movement between the North and the South is constrained by the need to keep the inviolability of the RK-US union. If Seoul begins to behave too capriciously, the US find enough influence levers (first of all - economic), to pull it up severely. Actually, that is why Moon fulfills the topic of denuclearization, positioning the inter-Korean summit as a step to the Kim-Trump summit, nominating the US president for the Nobel Peace Prize (for his wise sanctions have pushed the North to cooperate) and representing Seoul as a chief mediator between Pyongyang and Washington and as the organizer of their rapprochement. The current sanctions regime restricts the economic cooperation no less severely. If North Korea will respect the moratorium for the long time, Russia and China could try to draw an initiative to soften it – but “try” is a key word here. - Internal political situation in South Korea. The summit’s agenda was in many regards “invented” by Moon Jae-in, on the eve of local elections, which will be held on June 13. Since Moon is not so much a democrat as a populist, it is possible that after this the activity in the inter-Korean sector will significantly decrease. - The fate of Iranian nuclear deal. If Trump finally breaks it, North Korea receives another lesson that in the modern world guarantees may not work, and agreements may cost less that the paper on which they are written. It will be another argument in a piggy bank of not trusting the US. - The aggravation of the US-Chinese relations, related not only with trade wars, but also with the fact that Washington departs from the “one-China” policy. If the visit of Bolton – the new national security adviser, - to Taiwan takes place, some serious perturbations in the Washington-Beijing-Pyongyang triangle could take place. - Finally, it is not obvious if the summit of Kim and Trump happens, and if it does, whether the parties could agree. If Trump, as promised, “will get up and leave”, we can expect a new round of exacerbation, because the critics of Pyongyang will be able to safely state: “We were ready for dialogue, but since they refused to surrender, we have nothing to do but move on to the plan B from the word bomb”. If these dates are passed without incident, and the South Korean leader will be able to hold the next summit in Pyongyang with a more definite result in the autumn of 2018, the breakthrough will come.